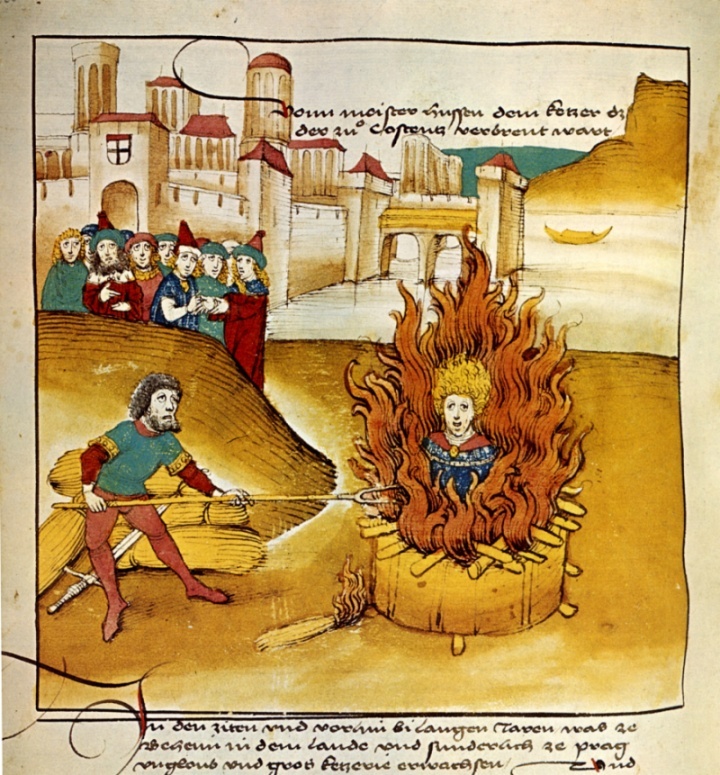 On this date in 1416, the Council of Constance had Jerome of Prague burned at the stake in the town square. This eloquent, injudicious theologian studied at Prague, Oxford, Paris, Cologne, Heidelberg … accumulating Master’s degrees along the way like a career graduate student, but repeatedly finding himself run off the premises on suspicion of heresy. Jerome’s “heresy” was an excessively combative hostility to ecclesiastical corruption. And although Jerome was known for his rapier tongue, he didn’t always find the pen mightier than the sword: he got into a few physical scraps with his foes. While in England, he copied out a manuscript of preacher John Wycliffe — whose radical piety (or pious radicalism) inspired the rebellious Lollard movement. 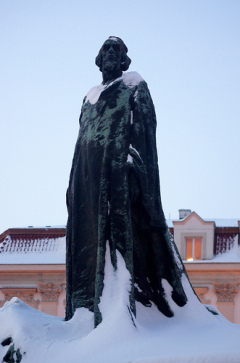 Back on the continent, Jerome fell in with Jan Hus. Ten years Jerome’s senior, Hus was and remains the first name in Bohemian religious reform, and the “Hussite” church he founded still retains his name. After Hus unwisely accepted a guarantee of safe conduct to dispute at the Council of Constance, the more ornery Jerome slipped into town to propagandize on his mentor’s behalf. 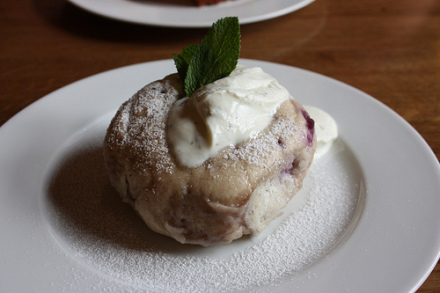 After placarding his way to trouble, he slipped back out and must have thought he’d had his cake and eaten it too … until he was caught in the Black Forest. Jerome spent nearly a full year in a dungeon — the Council met for four years; it had a massive schism to sort out — and at one point the privations of imprisonment led him recant. 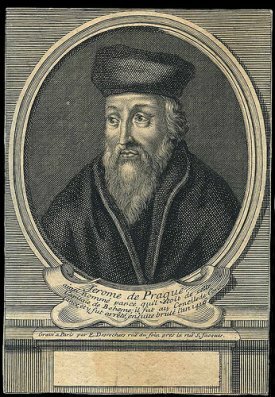 He later bitterly regretted that concession to “pusillanimity of mind and fear of death,” but on a strictly doctrinal level Jerome of Prague wasn’t anti-Catholic: he just wanted the church to be less of a bunch of corrupt, overweening racketeers. I have never seen any one, who, in pleading, especially in a capital offence, approached nearer the eloquence of the ancients, whom we so greatly admire. It was so amazing to see with what fluency of language, what force of expression, what arguments, what looks and tones of voice, with what eloquence, he answered his adversaries and finally closed his defence. It was impossible not to feel grieved, that so noble, so transcendent a genius had turned aside to heretical studies, if indeed the charges brought against him are true. Some of them he wrung hard by the sallies of his wit; while others he overwhelmed with biting sarcasms; and from many, even in the midst of sadness, he forced frequent smiles, by the ridicule which he heaped upon their accusations. At length, launching out in praise of John Huss who had been condemned to the fire, he pronounced him a good, just, and holy man, altogether unworthy of such a death, — adding that he was also prepared to undergo, with fortitude and constancy, any punishment whatsoever, yielding himself up to his enemies and the impudent lying witnesses, “who would, at length, have to give an account of all they had uttered, before God, whom they could not possibly deceive.” Great was the grief of all that stood around him. Thee was a universal desire among them to save so noble a personage, could his own consent be obtained. Persevering, however, in his opinions, he seemed voluntarily toseek death; and continuing his praise of John Huss, he declared that man had never conceived any hostility to the church of God; but that it was to the abuses of the clergy, and the pride, pageantry and insolence of her prelates alone he felt opposed; for, since the patrimony of the church was due, in the first place, to her poor; then to her guests; and finally to her on workshops; it seemed to that good man, a shameful thing, to have it expended upon courtezans and in banquets; for the sustenance of horses and dogs, the adornment of garments and other things unworthy of the religion of Christ. Most exalted was the genius of which he showed himself possessed! Often was he interrupted in his discourse by various noises; and greatly vexed by those who carped at his opinions; yet he left none of them untouched, but equally avenging himself upon all, he either covered them with confusion, or else compelled them to hold their peace. A murmur arising against him, he paused for a moment; and then, having admonished the crowd, proceeded with his defence, — praying and beseeching them to suffer one to speak whom they would soon hear no more. At none of the noise and commotion around him did he tremble, or lose, for a single instant, the firmness and the intrepidity of his mind. Reports differ as to the subsequent standing of all these men’s souls. But for the church as a going earthly concern, Jerome nailed it almost exactly: 101 years after he followed Jan Hus to the stake,* that long-suppressed spirit of reform irrevocably splintered papal authority. * In the very same spot where Hus himself was burnt.